For an introduction to the French New Wave, the first feature film from director Louis Malle is a good place to start. 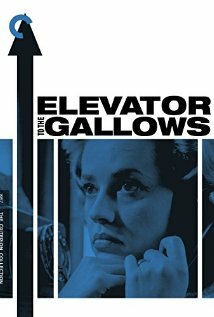 The neo-realism in this crime drama (based on the novel from Noel Calef) was new to film goers at the time, and even more startling was the natural lighting and minimal make-up used to photograph lead actress Jeanne Moreau. Beyond that, the haunting score from the legendary Miles Davis has been best described as “the loneliest trumpet”. The film jump starts with an emotional and desperate phone call between lovers shown in extreme close-up: Florence (Ms. Moreau) and Julien (Maurice Ronet). The two have plotted to kill her husband (his boss) – war profiteer Simon Carala (played by Jean Wall) – so that they can be together. The details of the perfect murder plan are carried out with the intention of making it appear like a suicide. Unfortunately for Julien, a frantic attempt to hide some evidence leaves him trapped in an elevator. The fallout from this bad break finds Florence believing he has deserted her, and creates a secondary story line involving the theft of his car by a couple of youngsters out for a good time. It’s here that the film bounces between the three sequences and really capitalizes on Malle’s expertise with a camera. Julien’s frustration in trying to escape the elevator generates the necessary tension, while the exploits of the young couple Louis and Veronique (Georges Poujouly, Yori Bertin) find them in a bad-situation-gone-worse when their impromptu party with a German couple (Ivan Petrovich, Elga Andersen) turns tragic. It’s easy to see how Jean Luc Godard was influenced by this young couple for his classic Breathless (1960). But best of all is the wandering woman of despair … we follow Florence as she tries to track down Julien on the rainy late night city streets. These shots of Ms. Moreau are truly spectacular thanks not just to the lighting, but also the realistic emotions of her facial expressions … we never doubt her feeling of resignation. Mr. Malle was only 26 when he directed this film, and the follow-up (also with Ms. Moreau) entitled The Lovers, also released in 1958. He had worked as an underwater photographer for Jacques Costeau and referenced this in the film. Malle had a long time marriage to Candice Bergen, and an incredible career that featured three Academy Award nominations (including Atlantic City, 1980). This was Ms. Moreau’s breakthrough film and led to her best known role in Francois Truffaut’s 1962 film Jules and Jim. She is still working today at age 87. She also had a successful singing career, as well as numerous love affairs (Malle, Truffaut, Pierre Cardin, and Miles Davis). Although there are some details and plot points that might annoy those who pay close attention, it doesn’t take away from the groundbreaking work of a young director who helped change the tone of movies. It’s interesting to note that Florence and Julien don’t share a scene in this film, outside of the opening phone call split scene. Additionally, the contemporary influence lives on through the line “Never leave photos lying around” (or on social media). A special thanks goes out to The Texas Theatre in Dallas for bringing this classic back to the big screen. This entry was posted on Sunday, October 4th, 2015 at 12:38 am and is filed under Articles, Drama, World Cinema/Foreign. You can follow any responses to this entry through the RSS 2.0 feed. You can leave a response, or trackback from your own site.